I was born in Kingston, Ontario in the early seventies with the genetic condition Cystic Fibrosis (CF). CF is a multi-system disease that affects mainly the respiratory and gastrointestinal systems. It is a chronic disorder requiring a great deal of medical care throughout one's life and becomes progressively worse with time before ending in lung failure. When I was an infant, I was diagnosed with numerous cases of pneumonia and was basically failing to thrive nutritionally. I was diagnosed with CF at 18 months of age thanks to the tenacity of my mother and her research in the pre-internet era. My parents were informed at the time of my diagnosis that the average age of survival for someone with CF was currently 5 years. It gradually increased to 18 years, then 30 and more recently Canadians with CF are living into their mid-fifties thanks to medical advances including lung transplantation. With a tremendous amount of care from my parents, they helped me to have a relatively normal childhood, going to school, taking part in sports, having sleepovers, and the like. It did, seem at times that they were stricter with me than with my brother and also stricter than my friend’s parents. However, they always had my best interests in mind and this helped me to learn how to take care of myself. By the time I reached double digits, I could count on having to be hospitalized each summer for a tune-up for 2-3 weeks of my vacation. It was in high-school that I was first introduced to using supplemental oxygen and wearing nasal prongs during a particularly bad lung infection. I graduated from high-school and after applying to 3 universities, decided it would be best for me health-wise to attend Queen's here in Kingston where I had family and medical support from the CF Team I had grown up with. After graduating from Queen’s, and immediately after being discharged from my very worst and scariest hospitalization ever, I left as planned to go off back-packing through Europe with a friend. This was as much a fun thing to do for me, as it was a way to prove to myself that I could do it. I continued with my schooling when I returned and graduated with a Pharmacy Technician Diploma and worked here in Kingston at various places including Shoppers Drug Mart, Kingston General Hospital, St. Mary's of the Lake Hospital and teaching the Pharmacy Technician course at the Kingston Learning Centre. It was while I was working at KGH that I met my better half, Simon, through a good friend and work mate. Without wasting any time, and once again immediately following a hospitalization, in 1999, I donned long white satin gloves to cover my IV and PICC line scars to marry the love of my life, Simon. Simon is the most caring person I know, marrying him was the best decision I’ve ever made. He made living with CF so much easier, helping out around the house and helping me with my day to day medical care without it seeming like a chore. Even as my health continued to decline at a pretty fair clip. By the time I reached thirty, my lungs were deteriorating very rapidly. On a good day my lung function was 30% and I was still holding down a full time position at St. Mary's of the Lake Hospital. I would go to work and run my own IV antibiotics while in the pharmacy as to miss the least amount of shifts possible. I would wake up early to do at least an hour of treatments before work and many hours after work just to start again the next day, I was exhausted. At thirty years old, I could no longer work, I had to leave my job and take long term disability. It was around this time that my CF respirologist, approached me about the possibility of a lung transplant. I put her off the first few times she suggested it as I really hadn't considered it as an option for myself. I had always seen myself following the natural path for a person with CF,dying at an early age as many had before me. I had heard of others who had gone the transplant route but I only knew two personally and neither of them had made it past a year post-transplant. My respirologist continued to try and convince me to at least go to Toronto General Hospital and talk to the lung transplant team before making any final decisions. With time and talking it over with my husband Simon, and my parents, I was convinced to at least learn a little more about lung transplants, so I could make an informed decision. So, off to Toronto Simon and I went. This was in early 2003 during the SARS epidemic in Toronto which made the trip even more daunting. We learned a great deal about transplants on our visit and l was told that I personally, being relatively young at the time, would have an excellent chance at living many years post-transplant. Back then, the statistics stated that 50% of double lung recipients lived to 5 years post-transplant, however, some recipients at the time were living fifteen years post-transplant. These statistics only continue to increase with better surgical techniques, better preservation of organs and tissue and better immunosuppression medications. The transplant team at Toronto General said they would like to see me every six months to monitor my condition so they would know when to add me to the transplant waiting list. Timing is a very necessary component when looking at when to be listed. The team want you to be in extreme need of a transplant, having less than a year to live usually, but well enough to survive major surgery – There’s not a lot of grey area. There was a lot going on for us here in Kingston around this time. My Dad was dying of cancer and he would have given anything to be able to donate his lungs to me. Unfortunately, we lost my father not long after my first visit to Toronto General. I do however, think that he was happy knowing that I was hoping to one day be listed for a lung transplant. I continued to meet with the transplant team every six months for a year and a half. At which point while on vacation in Nova Scotia, I had my second and much more severe episode of massive hemoptysis or haemorrhaging of the lungs. I was at Peggy’s Cove and I suddenly felt the blood rising in my lungs, Simon and I said our good-byes before he rushed off to get help and call an ambulance. I suffered a massive seizure, and lost consciousness just as Simon returned to carry me off the rocks with a couple other men who had gathered around. It is estimated that I coughed up 2 litres of blood before an ambulance rushed me rushed to the hospital in Halifax which was over 30 minutes away with sirens blazing. It was here that I was put on oxygen permanently which I had been using off and on over the last few years. My Mom flew out to meet us and she stayed at the hospital with me in Halifax for 2 weeks so Simon could make the drive back to Kingston. Upon my return to Kingston, my respirologist said it was time that return to Toronto to have an official assessment and hopefully be added to transplant list. All my tests went well, I was healthy other than my lungs which made me a good candidate, and I was added to the list. My mom and I (and Simon part time) moved to a condo in Toronto to begin the wait and I embarked on an exercise rehab program. I was informed that I would be waiting approximately 6-8 months for lungs to become available. During the first week on the list, while I was in an ER cubicle waiting for an in-patient room at St. Mike’s Hospital in Toronto, my lungs once again, began to fill with blood and massively hemorrhage from a burst bronchial artery. It was so bad this time that a code was called, I was intubated and put on a ventilator and admitted to the ICU. I no longer could breathe on my own even with supplemental oxygen, now a machine was doing the work. Ten days passed, the longest 10 days in my life as I was living hour by hour, hoping and praying to be able to hold on long enough. Simon, my mom and my brother, took shifts sitting with me 24 hours a day, ensuring that I was never on my own. On the 23rd of February 2005, my nurse entered my ICU room and told my mom and me that a set of lungs had become available. Someone had died and that person and their family had the forethought, compassion, and generosity to be an organ donor. It was a moment in time that I will never forget. A huge sense of relief washed over me, but the first thing I wrote on my notepad to my mom was that I felt sorry for my donor and their family. Twelve hours later, at 5am on February 24th, 2005 after waiting on the list for only twenty days, I was rolled into surgery. My name had soared to the top of the list due to the severity of my condition. I had the world renowned surgeon, Dr. Shaf Keshavjee, the head of the department, perform my surgery, perhaps because they had yet to transplant lungs into someone who was on a ventilator, like me. I remember him telling me afterwards that the set of lungs I received, were impeccable. I’ve always believed my donor to have been someone very young with their whole life ahead of them, cut short way too soon. Within a day, I was off the ventilator and in within 2 days, the physiotherapist had me up relearning to walk with a walker. I spent three months post-surgery in Toronto to complete mandatory rehabilitation. These three months were some of the happiest in my life. I was able to breathe, walk, do all the things normal people could do, and quite often take for granted. I spent time walking along the waterfront, walking the malls, and walking on the treadmill since I hadn't been able to for so long. I have had some pretty big bumps along this windy road since my transplant, but the extra time on this Earth that I have had with my friends and family far outweigh it all. I have done so much, I have enjoyed so many sunsets, I have travelled so many places, I have learned so many things, and I have met so many people in the time that my donor has given me. I am extremely grateful to my donor and their family for giving me this incredible gift of life. I am so incredibly lucky that it came when it did. It was without a doubt, a miracle perhaps with a little help from my dad up above. 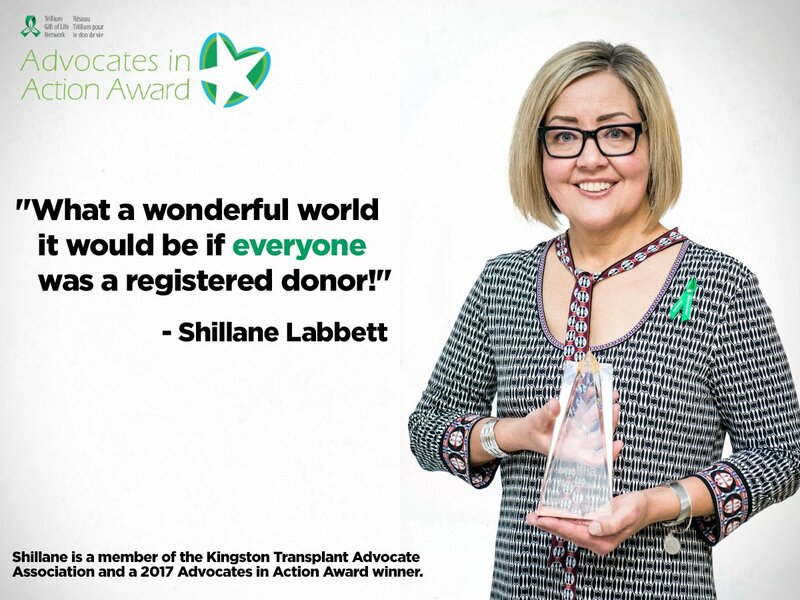 A few months after my transplant, my family and I wrote anonymous letters through the Trillium Gift of Life Network to my donor's family to express our sympathy for the loss of their loved one and to thank them for their kindness, thoughtfulness and generosity. Although the thoughts of loss will not recede, Please take comfort in the ultimate good deed, It was performed through the thoughtful donation, That answered our prayers of desperation, The change it has made is inconceivable, Just goes to show what is achievable, When caring souls make noble choices, And declare their wish through human voices, You can almost hear them, it's like fate, When it is spoken "We've decided to DONATE". Every year on February 24th, I have continued the tradition and even though, I’ve never met my donor family, I send a card through Trillium Gift of Life letting them know how grateful I continue to be and that a part of their loved one continues to live on in me.